Cluj Napoca: Heart of Transylvania-full version from Laviniu Lazar on Vimeo. The conference will cover areas like Academic Advising and Counseling, Adult Education, Asynchronous Learning, Business Education, Collaborative Learning, Curriculum, Research and Development, Distance Education, Distance Learning, Early Childhood Education, Early Literacy, Education Policy and Leadership, Educational Administration, Educational Psychology, Educational Technology, E-Learning Evaluation, E-Learning Tools and Systems, E-Learning Content Development, Higher Education, Global Education Systems, Special Education. 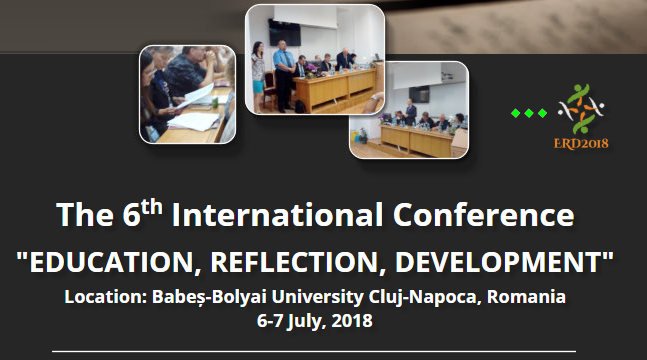 The ERD is the international event and brings together research papers that encompass conceptual analyses, presentation of effective didactic approaches in the educational design, implementation and evaluation. For more information, please visit the Educational Science Department, within the Faculty of Psychology and Educational Sciences, BBU.